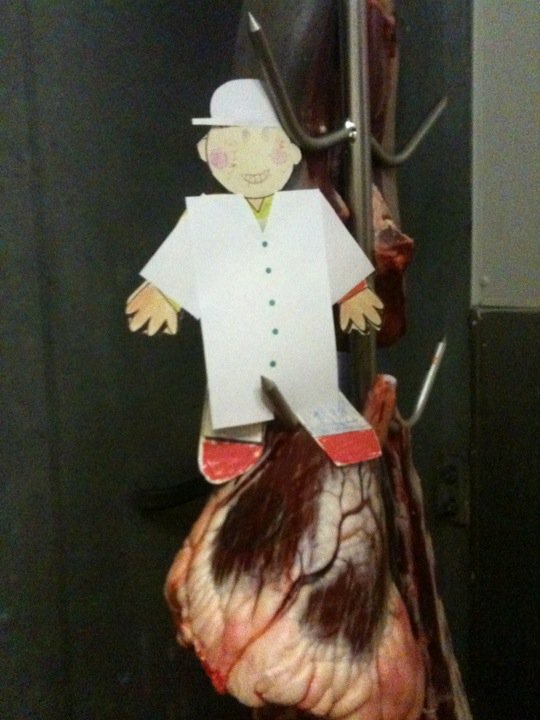 Flat Stanley Thinks & Learns About Meat Processing - JP loves LIFE! Your Flat Stanley came to visit us at Pennsylvania State University (you can see him in the photo here with our legendary football coach Joe Paterno who we sometimes call JoePa). While we love our Penn State sports teams, our students also have a chance to learn a lot about different things they are interested in. I work in the college where students learn about agriculture and food. Not sure if you know but there are people who study meat and are called meat scientists! Yes, I bet you can guess that most of us like steaks, burgers, etc! Well, since Stanley said you think cows taste good, I thought you may like to see some of the things Stanley saw on a tour of the place where we process meat and make sure that our food will taste good and keep us healthy. We took some time to talk about the history of meat processing and the way that so many things have changed. In a lot of cities there used to be a stock yard where farmers and ranchers would bring livestock to sell them to the butchers and packers who would take the next step in the food chain. Farmers and ranchers tag their cattle so they can keep thorough records on that cow’s birth, feeding, etc. nicely organized. The information follows to the butcher too. As the butcher works with the beef, they make sure to keep everything really clean so it’s safe for us to eat. Most of our tour was of machines! Most people don’t get to see some of these machines when they are buying meat because they go to the grocery store or the front part of a butcher’s shop, but all of this is really important equipment for getting the meat to people who are hungry! Since Stanley is so flat, he got to go into places most of us can’t fit. And he did things that aren’t safe either! But it’s helps us understand some of the machines and he IS made of paper so I guess it’s ok. Just don’t try this at home. J The machine on the left lets butchers make cubed steaks (ummm. man candy), then he went up in the injector – it’s a tough piece of machinery too that was leaking & Stanley found the leak & helped fix it! He also went for a ride on the smokehouse tree that keeps meat in the smoker. Smoked ham, bacon, brisket… YUM! More machines butchers use! Stanley found them really interesting. And was surprised how big the saw was. It was kind of funny to see him checking out the meat slicer cause some people like their lunch meat paper thin just like Stanley so butchers know what that is like! Butchers also have things they use to get information about the meat, here Stanley is checking out the machine that lets us know about the marbling which helps us understand how tender the meat will be so we know what to use it for! He also checked out the vacuum chamber that butchers use to wrap the meat for freshness & safety. And he even hopped in the display case and caught some fluorescent rays! Not sure how this got left behind but Stanley thought the pig or sheep restrainer would make a good jungle gym! He looked like he could become a gymnast! We also found a safety reminder…. But it may have been a little too late! But we were sure to follow the rules the rest of the time. As the butcher works with the beef, they make sure to keep everything really clean so its safe for us to eat. We wear lab coats and because big pieces of meat are moving around and some things could be up high, we also put on hard hats. We use series of hooks, etc to store & move meat. Stanley had a chance to see a lot of what we were doing for meat and I think it made him hungry! See more Stanley Adventures here.